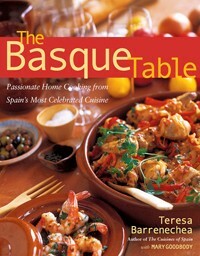 In the Basque region of Spain, food and eating are the center of everyday life and the focus of endless conversation. This award-winning, internationally acclaimed cookbook presents 130 recipes for casual, elegant fare from this food-centric region’s increasingly popular cuisine. With an emphasis on high-quality fresh ingredients, simply prepared, the Basque style of cooking fits right in with today’s back-to-basics focus on whole foods. For starters, there are plates full of pinchos, the Basque version of tapas, including Eggs Stuffed with Anchovies and Tuna, and Smoked Salmon and Asparagus Pinchos. Among main courses, there is a wealth of light and healthy fish and shellfish fare including Cod-Stuffed Piquillo Peppers with Biscayne Sauce and Red Snapper Guernica-Style, and rustic and hearty meat and chicken dishes such as Top Loin of Pork Cooked with Milk, Chicken Breasts with Garlic and Parsley, and Venison with Red Currant Sauce. Soups, stews, salads, and sides round out the feast.